We love books at our house! So, can you imagine how excited I was when new books arrived in the mail for us to review??? Baker Publishing Group sent us two books to review! Baker Publishing Group publishes books on a wide variety of Christian-based topics including discipleship, marriage, parenting, self-help, and theology. They also publish numerous Christian fiction books including romance, historical fiction, Amish, and suspense. We reviewed the first two novels in the series The Adventures of Lily Lapp. These books were written by two authors. The first author, Mary Ann Kinsinger, grew up in an Old Order Amish community and now writes about her childhood memories. Suzanne Woods Fisher, the second author, has written many Amish fiction books for adults. Life with Lily – In this book you are introduced to Lily Lapp, a five-year-old girl living on a farm in upstate New York. 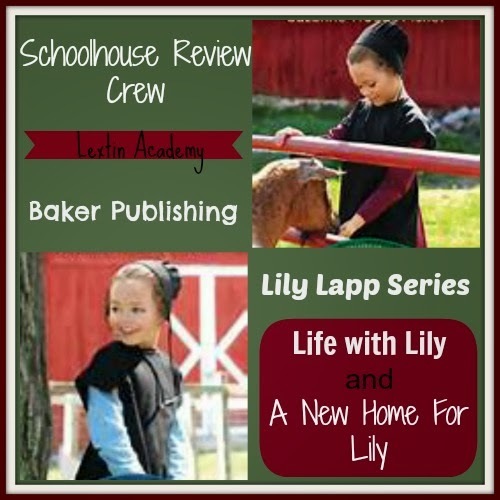 Lily is an adventurous and curious little girl who is being raised in a small Amish community. You are introduced to a world of horses and buggies, one room schoolhouses, and family values that center around simplicity and faith. Lily welcomes a new baby brother who isn’t quite what she expected and she wonders if she’ll enjoy her role as a big sister once again. In other chapters Lily attends the small community school and learns how to handle peer pressure from another student who might be a little too adventuresome and cavalier. You also read about Lily’s family’s small farm, their cow who likes to wander, her little brother who finds himself in several scrapes, her new teacher who doesn’t seem to know how to smile, and the preparations to move to a new state and new Amish community. Through the book, Lily finds herself in numerous difficult or humorous situations but she learns new insights about others and even herself as she works to overcome. A New Home for Lily – This is the second book of the series and continues with Lily’s story after her family’s move to a new farm in a new state. Now Lily is living in a new Amish community where she must make new friends, learn her way around a new school, and experience even more changes as her family expects another baby. In the book, Lily comes up with plan to make money through selling her homemade stickers. She also suffers through the school days because of a little boy who is a huge annoyance. Lily learns to get along with others, participates in a Christmas program, goes sledding, and helps her father build a new barn. Both books retail for $12.99 each for softcover print or E-book versions. These books are geared for children between the ages of 8-12. These books are both somewhat long – at over 250 pages each. This is quite a long book for a young reader like Curly but she did not find them too challenging. The sentences are fairly short and the vocabulary is simple so that she was able to read and comprehend what she was reading. We read the books separately and discussed them together after about every 5 chapters. We had many discussions about the differences in the Amish lifestyle and our own. This was Curly’s first time to read an Amish book so she was enthralled with the topic and had many questions. Nothing! We really enjoyed these books and found them to be a fun and interesting read. The books give an interesting glimpse into the Amish lifestyle while staying true to a young girl’s perspective. We learned a lot of interesting things about farm life and life in an Amish community. The books sparked interesting discussions and inspired further research into the Amish lifestyle. Young Lily Lapp is a typical little girl who is curious, creative, fun, and sometimes finds herself in trouble. We enjoyed that her character was realistic in that she found herself in difficult situations – sometimes even self-created problems. Then we were able to read how she overcome those problems or learned from those situations. There were good lessons to be learned but they weren’t presented in an overly “preachy” tone. Each chapter reads like a short vignette with a look into the life of a young Amish girl who is curious and sometimes mischievous. We found that we so enjoyed each little glimpse into the Amish lifestyle from the perspective of a young girl. Curly loved the stories and felt she could relate to Lily as she learned about friendships and family life. She was excited to read about a girl who was close to her own age, yet lived in a much different way. I found the books to be sweet and a great read for the recommended ages. I really enjoy reading Amish fiction and so I was excited that Curly could enjoy the same subject, just at her own level. We plan to order the other books in the series so we can continue following the adventures of Lily! Read thoughts from the Crew on Baker Publishing!